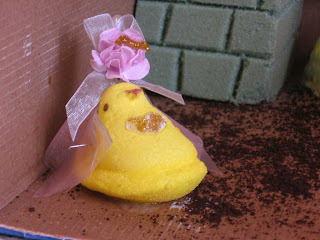 My school is running a Peep Contest. 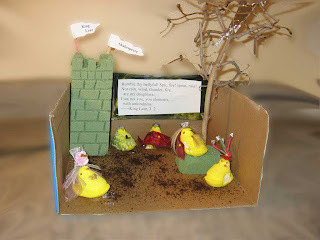 Pick a story or a novel and create a diorama using marshmallow peeps. 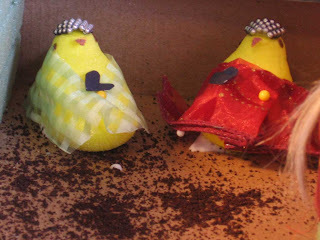 Teachers are allowed to play too....so my wife and I decided to honor the Bard with our interpretation of King Lear. Lear's youngest and most beloved daughter, Cordelia, refuses to flatter her father, going only so far as to say that she loves him as much as a daughter should. 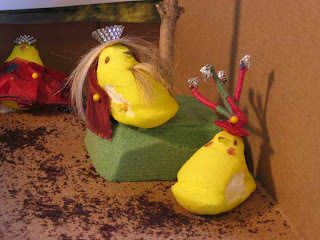 Lear, unjustly enraged, gives her no land. The Fool is Lear’s own stand-up comedian, sure, but more interestingly, he’s the only guy that Lear allows to criticize him. Maybe it’s because the Fool is, well, a fool, but Lear doesn’t seem to care that he’s really hitting him where it hurts (i.e., Cordelia). My wife was the designer behind most of this. 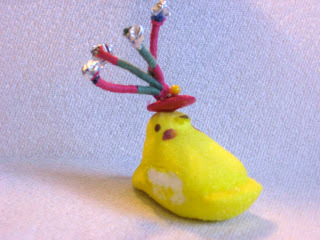 I was just the stage hand who ate the occasional peepy mistakes.